Wendell Berry’s Imagination in Place is mostly a book about the lives of writers, including his own. Reading it recently, I was reminded of the visit I paid to him and his wife, Tanya, on their farm in Kentucky years ago, when the relationship of writers to their place in the world was much on my mind. Here is my story of that visit, published first in Sierra magazine, November/December 1990. Wendell Berry lives in a part of Kentucky that does not appear to change. Narrow lanes wind through quiet valleys; hawks light on roadside trees. Cars seldom pass the white-gabled houses. To my casual eye, it all looked pretty much as it did 18 years ago when I last visited Lanes Landing Farm near the town of Port Royal. Since that first visit, I have taught in half a dozen universities and lived in half a dozen places. Berry, steady as the land around him, has stayed on with his wife, Tanya, in his steep-roofed house overlooking the Kentucky River, farming, writing essays, fiction, and poetry, and making occasional forays elsewhere to teach, lecture, or read from his work. He has remained there not by chance, or because he had nothing better to do, but because 25 years ago he made a deliberate choice. He wrote about that decision in one of his early essays, “The Long-Legged House,” the first piece I ever read by him. The long-legged house was a two-room cabin built by his grandmother’s bachelor brother back in the 1920s. As a young man, Berry often visited the house by the river. Still, they left the house on the river. Berry studied with author Wallace Stegner at Stanford, sojourned in Italy on a Guggenheim fellowship, and taught at New York University. Not until 1964, when he was 30 years old, did he and Tanya and their two children return to Kentucky with the idea, this time, of staying. Teaching at the University of Kentucky in Lexington, he spent four days every week writing at the long-legged house. When the nearby Lanes Landing property was put up for sale, Wendell and Tanya bought it as a summer place. But as they visited the house on weekends and walked the land, they “began to see possibilities” they could not resist. That commitment to a scrap of land in Henry County changed Wendell Berry as a writer. He has recalled for me what happened. “I was assuming that I was going to lead a literary life when I got back here,” he said. But he found that his relationship with the place he had chosen could not be merely literary. To agriculture specialists, the fact that one American farmer can feed 80 people may be a solution; to Wendell Berry it is a problem. We would be better off, he believes, if more than 3 percent of America’s people farmed the land, using fewer chemicals and machines. Berry speaks in this book with the voice that has set him apart from most contemporary writers and intellectuals. He is no timid postmodernist offering long halls of mirrors, illusions and guesses, ironies and double meanings. Berry sounds as certain of the truth – the hardrock, basic truth – as if God had given it to him. When I visited him this year, settling in for a morning’s talk near the wood stove of his living room, I found Berry as fierce as ever. His manner was kind, as down-home and companionable as the chairs and book-laden tables around us, but his thoughts were unflinching. America has turned its countryside into a Third World colony, he said. “The larger economy, the national economy that is really run for the benefit of a very few people, is preying upon and slowly destroying local communities everywhere. I thought of my own family: Just about everyone in my grandparents’ generation lived on Kentucky farms, and none of their descendants do now. Berry himself might easily have broken his family’s long rural residency (they’ve been in this part of Kentucky since 1803); instead, he committed himself to a way of life that most educated folk of his generation rejected. And that commitment involved more than just living in the country and writing about it: He imagined his way deep into local culture. In his fiction, Berry spins a web of country life as intricate and lovely as a spider’s on a barbed-wire fence. In The Memory of Old Jack, The Wild Birds, Nathan Coulter, and other novels and stories, generations intertwine as parts of a community Berry calls a “membership.” They live in one another’s minds, rely on one another, care for one another, learn from one another how they best can live. There is in these books an affection for country life so intense it resembles romanticism. Driving up through the country, I had been flooded by memories of great-aunts and uncles who had lived country lives that, to my recollection, had been lonely and hard. They didn’t seem anything like the lives in Berry’s fiction. Berry has confronted those exclusions in his book The Hidden Wound, a meditation on his family’s slave-holding past and his own boyhood experience with blacks on his grandfather’s farm. Trying to come to personal terms with racism, the “hidden wound” that all American whites bear, he found a relationship between the exploitation of human beings and the exploitation of nature. By enslaving blacks, he observed, whites cut their own ties to the land. By assigning hard “hand labor” first to slaves, later to machines, whites avoided intimacy with nature. Disconnected, whites no longer cared, and what they no longer cared for, they destroyed. “The white race in America has marketed and destroyed more of the fertility of the earth in less time than any other race that ever lived,” he wrote. Certainly, dinner with the Berrys was just what you’d imagine an authentic country dinner would be: a variety of tastes, all seeming to come straight from the food itself, and the pleasure of company besides. Tanya had come home from church by mealtime, bringing with her the Berrys’ two granddaughters. We ate together at a big round table in the kitchen. The girls ate quietly, then climbed into Tanya’s and Wendell’s laps and listened to our conversation, occasionally trading places. One of the remedies Wendell offers for our current cultural mess is a shift to more regional economies – cities buying food and dealing with their garbage within their region. “We’ve got to scale our economy down,” he said. “We’ve got to have a more decentralized, locally adapted kind of economy.” In “The Pleasures of Eating” he suggests things city-dwellers could do to help halt the decline of rural life: grow and prepare their own food so they know what it’s all about, buy close to home, buy directly from farmers. If rural America is to be saved, it will have to be saved by those who live there, Berry believes. “People who are left in the country are going to have to start helping each other again in practical and economic ways,” he said. In his own community, he has been trying to start a small-loan program, and has been to the state capital to protest other states’ dumping their garbage in Kentucky. To some readers, Berry’s preoccupation with the country renders him simply an ignorant Luddite, out of tune with his times. He stirred up a hornet’s nest when Harper’s Magazine reprinted a brief essay in which he explained why he does not use and will not buy a computer. According to my reading of the essay, Berry uses pen and paper because he regards computer manufacturers as a conniving bunch who try to get people who don’t need computers – like farmers and students – to spend significant sums of money on them. Moreover, computers depend on electricity, and he tries to use as little of that as he can. Finally, he likes his working relationship with Tanya, who types his work on an old Royal Standard and makes editorial suggestions in the margins. Reader response was sharp-tongued. Reading Berry, said one letter-writer, was like “reading about the belief systems of unfamiliar tribal cultures.” He suggested Berry try a quill pen. 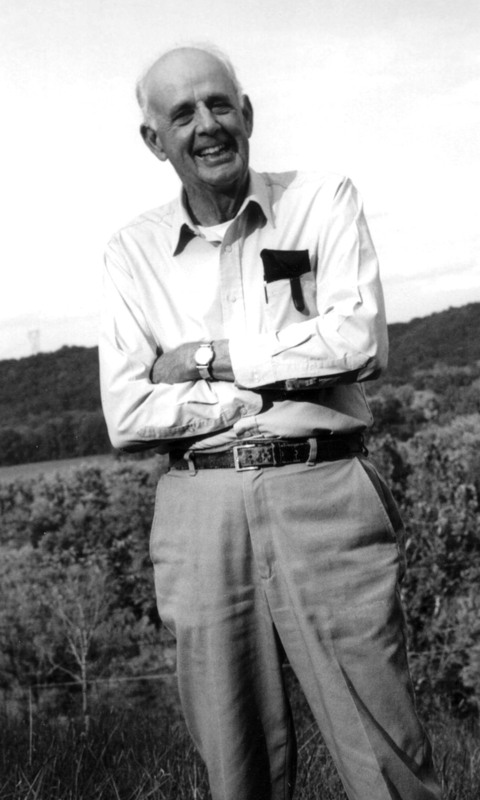 Logsdon was working at Farm Journal when he read “The Long-Legged House.” He interviewed Berry and found his example so powerful that he wound up quitting his job and going back to his homeland to farm and write. Berry’s front window looks straight out across the river valley to a ridge of hills. Before I said goodbye, we studied the tranquil scene together. In the center of the frame, in the valley on the other side of the river, stood an abandoned tenant house. I wondered why people didn’t tear down those tattered, empty buildings; Berry wondered why people didn’t still live in them. For Berry, a commitment to a place is like marriage. “When you talk about marriage to a place,” he said, you’re talking about final commitment. You’re not going to leave. You’re going to give up that other-so-lucrative motive of the industrial world: the idea that you’d be better off somewhere else or with somebody else. “If you live in the presence of your history, it’s harder to be arrogant. If you are not living in the presence of what you’ve done, which will always include some damage, it’s too easy to be arrogant or silly. That’s why some kind of social stability is necessary so that people aren’t, all the time, escaping from their own history and the damage they’ve done. “I live in this commitment all the time, knowing very well how attractive mobility is. I’d really like to be loved by somebody who doesn’t know me, who would be susceptible to my charm.” His eyes twinkled, as they often do; at 56 he is an attractive man, capable of taking pleasure in his own delightfulness. “I appreciate, exquisitely, how fine that would be. But I know it wouldn’t last, and that I couldn’t disguise myself for more than, oh, maybe 48 hours.” His big laugh poured out. That reminded him his ewes needed seeing to, so he went off for a while. Not long after, I drove down the wandering road, imagining what it would be like to pick a place on Earth and stay there, and take care of it. Photo by Guy Mendes, courtesy of Indiana University. Use the contact form below to write to Carol Polsgrove.